I’m hoping The Retrospectoscope will be a series, if readers are interested. Here I hope to pull little bits out of a whole lot of historical medical and health texts. Feel free to discuss as you like. The bias will be toward Western books from the 17th to 19th century, as that’s what’s in my collection. If you have other scans that you’d like to drop into the suggestion box, please drop me an email: lauredhel at disabledfeminists.com. Today’s snippet is from Philippe Pinel’s A Treatise On Insanity. 1806. Pinel, who was a physician at Bicêtre Hospital in France, is widely considered the “father of modern psychiatry”. 108. 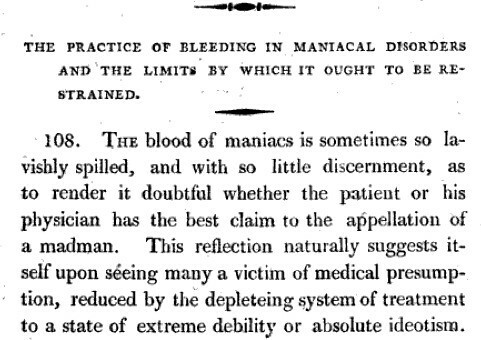 THE blood of maniacs is sometimes so lavishly spilled, and with so little discernment, as to render it doubtful whether the patient or his physician has the best claim to the appellation of a madman. This reflection naturally suggests itself upon seeing many a victim of medical presumption, reduced by the depleteing system of treatment to a state of extreme debility or absolute ideotism.